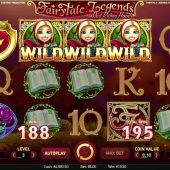 Red Riding Hood is the first in a series from NetEnt called 'Fairytale Legends'. Straight away I am questioning the use of symbolism and themes you would find in a 4-year old's bedtime story in slots aimed at 18+. The game is to be found at nearly every multi-platform casino so readers do need to be aware of the mechanics. 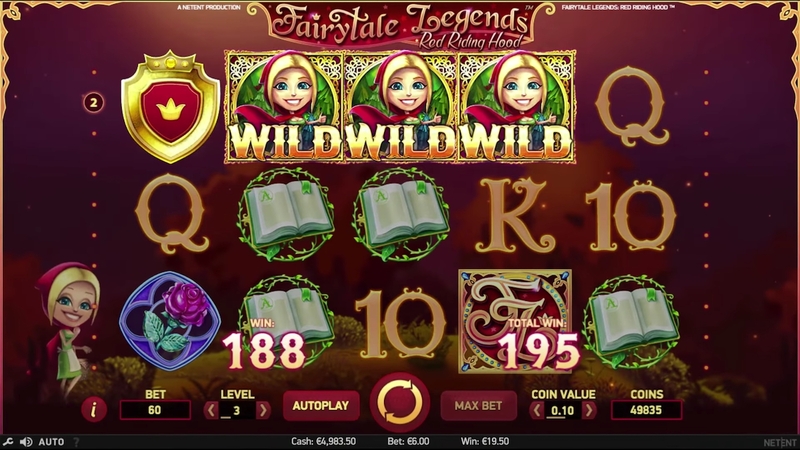 Red Riding Hood slot has the 5-reels, 3-rows and the picture symbols are all stacked, unlike the basic A-K-Q ones. There are 20 paylines and single Wilds on reels 2, 3 and 4. The highest pays 20x stake for 5-of-a-kind (5OAK) and the lowest letter 2x stake for 5OAK. The Wilds don't multiply but should you get 2 or more you get respins until no further Wilds are added. There are however, several features available. After any losing spin the fairy may appear and wave her wand and overlay the screen with several medium symbols, but not the highest nor the lowest A-K-Q ones. You get a guaranteed win. During a spin she may add Wilds to the middle 3 reels which should award a win and of course you get the respin after this. The final in-play feature is our busy fairy adding medium symbols in a block before the reels stop. If they are all on reels 2-5 you may not get a win when reel 1 doesn't match. Should you land 3 treasure chests on reels 1, 3 and 5 you choose one to gain one of 3 features. This is similar to the trigger and features on Netent's Guns 'n Roses slot. One chest may trigger a simple coin award of say 15x stake. The second is the Wolf Run trail bonus. You will have a trail and a number spinner similar to the Leprechaun Trail on Rainbow Riches. You get awards x stake added each time you progress, and may hit 'double award' and other enhancements. You progress until the wolf leaps out and attacks Red Riding Hood. The final coin total is awarded, and is usually quite decent. The bonus you really want is the 10 free spins. These are enhanced by having the Wilds appear on reels 1 and 5 unlike the base game, so the chances of hitting decent wins are better and in addition you are therefore far more likely to get the respin feature occurring when you get 2 or more Wilds in any spin. There is no retrigger but each chest appearing adds 2 free spins. It can go on for 40-50 quite easily. The award for free spins seems always to be quite good! If one ignores the questionable use of infantile graphics the mechanics of this 96.33% RTP game are quite good. The in-play features are quite frequent and 'big wins' (Netent's title for 15x stake plus!) are quite common with the stacked symbols. The frustration is in getting the 3 chests and not hitting the bonus you desire, having it chosen for you. The free spins are quite entertaining although the maximum win is on 400x stake on the game. Will you follow Red Riding Hood on her travels?